If Rihanna skipped the Met Gala because of her Anti world wour, you know it has to be a pretty amazing show. And judging by Tuesday's star-studded performance at The Forum in Inglewood, California, the show is definitely worth Rihanna skipping out on this year's Met Gala for. 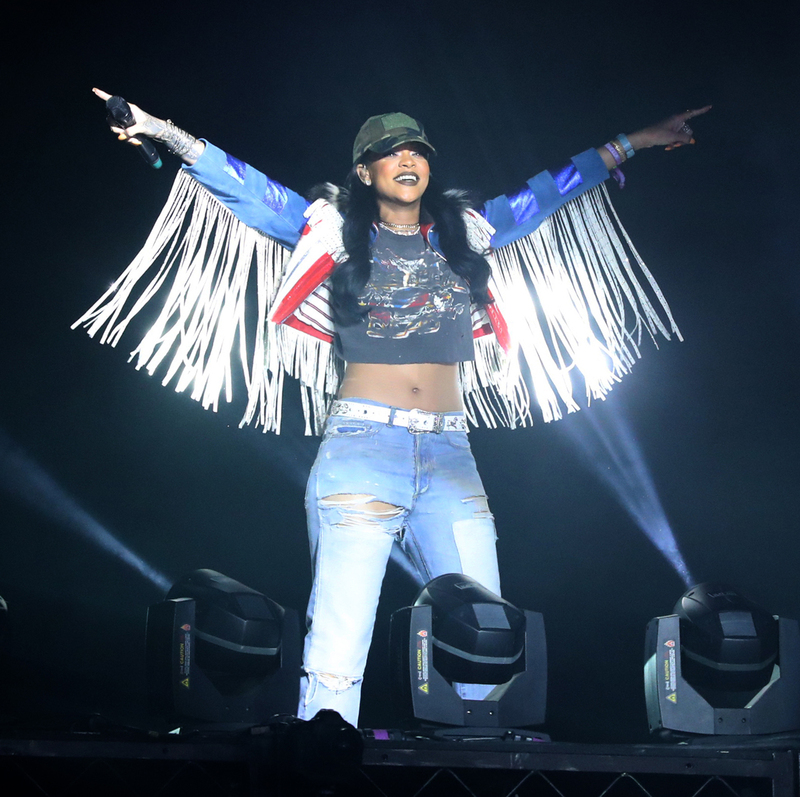 Considering how stylish the singer is, the audience is guaranteed to break out their finest outfits, and this is what to wear to Rihanna's Anti world tour if you want to channel some of the celebs who attended Tuesday's show. Nicole Richie and Jessica Alba (and their crew of friends) all showed up in the same exact matching black t-shirt for the singer's performance. And although Rihanna's tour merchandise is totally cute (I mean, check out this sports bra), Richie and Alba don't appear to have picked those tees up at the venue. The black crew necks are emblazoned with a black-and-white image of the singer looking at the camera. Although the effect of wearing someone else's picture on your shirt could've been weird, the shirt managed to look a little artsy and avant-garde and not at all out of place. And who wouldn't like to see their friends and fans sporting their face during a performance? The look totally works. And although I don't know where Richie and Alba's group picked up their actual shirts, who says you can't draw a little inspiration and wear a Rihanna-themed t-shirt to the show? Here's six cute options. Want to keep it simple? This Etsy shirt is the perfect pick. Love this graphic tee with lyrics from Rihanna's latest hit song. I love this graphic tee as well, and it's a pretty subtle way to pay homage to the singer. Not looking for subtle? This tee is the perfect pick (and would look totally normal with a jacket thrown over the top). Another not-so-subtle pick, but it shows off the singer's sassy side. Another lyric tee, but this time a little sassier. Of course you'll have to pick up another t-shirt from the singer's tour shop when you're at the concert, but this is a great way to show your fandom during. And, this celeb-endorsed fashion trend doesn't break the bank.